music and movie files NOW! AnyConverterX supports any kind of protected Windows Media Audio files (WMA), MPEG4-AAC Audio files (M4P, M4A, M4B), Real Audio files (RAX, RA), YouTube video (FLV) and almost any music or movie that can be played with Windows Media Player, QuickTime Player, RealPlayer or Rhapsody Player. You can convert protected M4P to MP3 format and unprotect WMA files for playback on any MP3 device. Using AnyConverterX converter makes it possible to watch protected iTunes video on Zune and Windows Media Video WMV on iPod. Our program also supports long-lasting audio books. AnyConverterX also works on 64-bit OS. 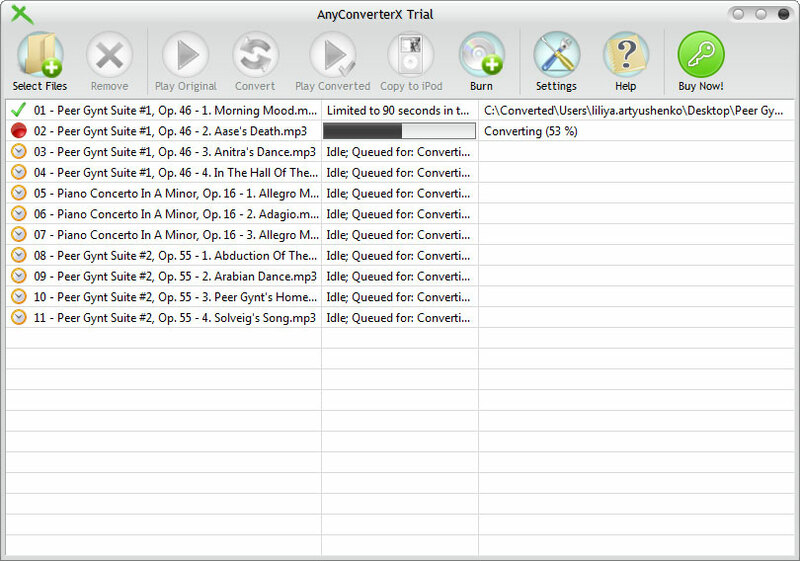 AnyConverterX is a powerful piece of software to convert any purchased or copied music or movie files and almost any audio and video files, both protected and non-protected, to commonly used formats such as MP3, AAC, WAV audio, MPEG4, DivX video. Our program gives you the ability to convert any kind of protected media to regular audio and video formats, that can be played on dozens of compatible devices. AnyConverterX introduces the unique technology maintaining extremely effective PC utilization in order to perform high conversion speed and reliable conversion results. This software actually supports any kind of protected Windows Media Audio files (WMA), MPEG4-AAC Audio files (M4P, M4A, M4B), Real Audio files (RAX, RA), long-lasting audiobooks (AA) and almost any music or movie that can be played with Windows Media Player, QuickTime Player, Real Player or Rhapsody Player. The only condition is that the music content must be legally obtained and can be played on the computer where AnyConverterX is installed. AnyConverterX converts video files of any kind to commonly used iPod MPEG4 files (MP4) and DivX files (AVI, DIVX) for playback on home video devices. With our program you are not bound to your PC anymore and can play your movies on almost any device you like. AnyConverterX converts protected WMV files (Windows Media Video) to regular MPEG4 files (MP4) for iPod devices or converts WMV to DivX format for home DVD/DivX players. 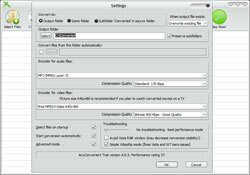 This program can also convert protected iTunes video files (M4V) to MPEG4 or DivX. And these are only few examples of many available operations. The key feature of AnyConverterX is its simplicity. You may actually convert your whole media library of protected and non-protected content to regular audio and video files at one click. All you need is to drag'n'drop media library folders or a huge list of files to AnyConverterX window. Other distinctive features of AnyConverterX are the extremely high conversion speed for protected audio files and high sound and video quality of the converted files. You may convert DRM WMA to MP3 files with up to 50x conversion speed in batch mode. Actually the conversion speed is limited by your PC performance only! We, the developers of AnyConverterX, would really like to thank all users who support us. The development of AnyConverterX will continue. The last version of our program features new YouTube Ripper plug-in and easy to use Audio CD Ripper. So from now on you're able to convert music from audio CD's as well as from your hard disk drive and save your favourite YouTube videos to PC in the desired digital format. Obviously, we provide support for our product and you can contact our Support team at any time. We take care of our customers. Whatever kind of media you need to convert, AnyConverterX is the best choice for you. So forget about any limitations and enjoy your music and videos everywhere!